Keeping an eye on the market helps us plan ahead, but what direction is the luxury real estate market headed? What are the ways we can increase engagement on our online listings? And how can we get better at communicating with our clients? In this episode, Stephanie Anton shares her digital marketing tips and predictions on the luxury real estate market. Properties that have more photographs get more clicks and have higher engagement rates. The more photographs you have for an online listing, the better. Videos aren't supposed to give the viewer a property tour. They’re supposed to tell a story. Affluent buyers don’t buy properties because they need a roof over their heads. They buy them because of the lifestyle that comes with the property. The language we use should be influenced by the buyer’s motivation. We have to be on the same wavelength with the buyer, and to do so we have to find out whether they’re looking for a temporary house or a permanent home. In the beginning of the episode, we talked about what attracts attention to online listings and how we can optimize videos to attract the right buyers. Next, we talked about how we can determine the motivations of the buyer. We also discussed why it’s important for us to be aware of them. Surveys show that a large percentage of the real estate luxury market is looking to buy, and a very small percentage is looking to sell. There’s still a strong demand to buy real estate among those who are well off. A good reason for this consumer behavior could be the growth we’ve seen in the global net worth. 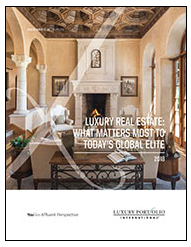 This interest in buying luxury real estate isn’t limited to North America. The trend has been been noticed in Europe and Asia as well. Stephanie Anton is the President at Luxury Portfolio International, the luxury division of Leading Real Estate Companies of the World. Stephanie has been running the daily marketing operations for Luxury Portfolio International since 2005, and since then she’s been invited to speaking events on the international luxury market. If you’re interested in joining a marketing program for top performing brokerages, you can find our more about it here.